With a radar approach, the pilot receives course and altitude guidance from a controller who monitors the progress of the flight with radar. This is an option should the pilot experience an emergency or distress situation. The only airborne radio equipment required for radar approaches is a functioning radio transmitter and receiver. The radar controller vectors the aircraft to align it with the runway centerline. The controller continues the vectors to keep the aircraft on course until the pilot can complete the approach and landing by visual reference to the surface. There are two types of radar approaches: Precision (PAR) and Surveillance (ASR). A radar approach may be given to any aircraft upon request and may be offered to pilots of aircraft in distress or to expedite traffic; however, an ASR might not be approved unless there is an ATC operational requirement or in an unusual or emergency situation. Acceptance of a PAR or ASR by a pilot does not waive the prescribed weather minimums for the airport or for the particular aircraft operator concerned. The decision to make a radar approach when the reported weather is below the established minimums rests with the pilot. 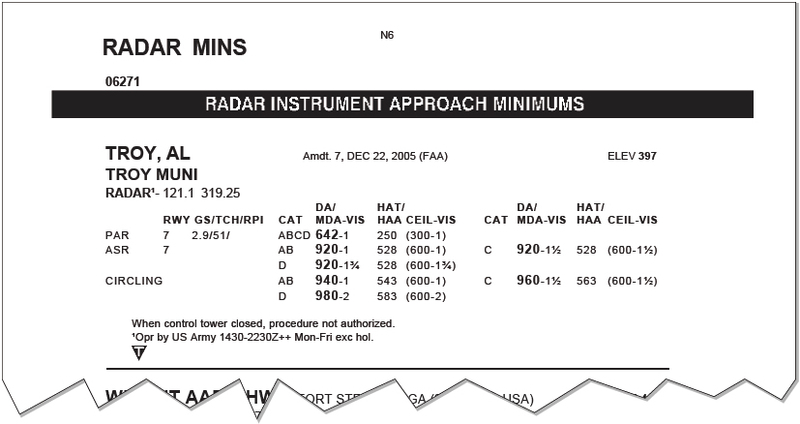 PAR and ASR minimums are published on separate pages in the FAA TPP. Figure 10-10. PAR is one in which a controller provides highly accurate navigational guidance in azimuth and elevation to a pilot. The controller gives the pilot headings to fly that direct the aircraft to, and keep the aircraft aligned with, the extended centerline of the landing runway. The pilot is told to anticipate glidepath interception approximately 10 to 30 seconds before it occurs and when to start descent. The published decision height (DH) is given only if the pilot requests it. If the aircraft is observed to deviate above or below the glidepath, the pilot is given the relative amount of deviation by use of terms “slightly” or “well” and is expected to adjust the aircraft’s rate of descent/ascent to return to the glidepath. Trend information is also issued with respect to the elevation of the aircraft and may be modified by the terms “rapidly” and “slowly” (e.g., “well above glidepath, coming down rapidly”). Range from touchdown is given at least once each mile. If an aircraft is observed by the controller to proceed outside of specified safety zone limits in azimuth and/or elevation and continue to operate outside these prescribed limits, the pilot is directed to execute a missed approach or to fly a specified course unless the pilot has the runway environment (runway, approach lights, etc.) in sight. Navigational guidance in azimuth and elevation is provided to the pilot until the aircraft reaches the published DH. Advisory course and glidepath information is furnished by the controller until the aircraft passes over the landing threshold. At this point, the pilot is advised of any deviation from the runway centerline. Radar service is automatically terminated upon completion of the approach. ASR is one in which a controller provides navigational guidance in azimuth only. The controller furnishes the pilot with headings to fly to align the aircraft with the extended centerline of the landing runway. Since the radar information used for a surveillance approach is considerably less precise than that used for a precision approach, the accuracy of the approach is not as great and higher minimums apply. Guidance in elevation is not possible, but the pilot is advised when to commence descent to the Minimum Descent Altitude (MDA) or, if appropriate, to an intermediate step-down fix Minimum Crossing Altitude (MCA) and subsequently to the prescribed MDA. In addition, the pilot is advised of the location of the Missed Approach Point (MAP) prescribed for the procedure and the aircraft’s position each mile on final from the runway, airport, heliport, or MAP, as appropriate. If requested by the pilot, recommended altitudes are issued at each mile, based on the descent gradient established for the procedure, down to the last mile that is at or above the MDA. Normally, navigational guidance is provided until the aircraft reaches the MAP. Radar service is automatically terminated at the completion of a radar approach. No-Gyro Approach is available to a pilot under radar control who experiences circumstances wherein the directional gyro or other stabilized compass is inoperative or inaccurate. When this occurs, the pilot should so advise ATC and request a nogyro vector or approach. The pilot of an aircraft not equipped with a directional gyro or other stabilized compass who desires radar handling may also request a no-gyro vector or approach. The pilot should make all turns at standard rate and should execute the turn immediately upon receipt of instructions. For example, “TURN RIGHT,” “STOP TURN.” When a surveillance or precision approach is made, the pilot is advised after the aircraft has been turned onto final approach to make turns at half standard rate. PAR facilities operated by the FAA and the military services at some joint-use (civil and military) and military installations monitor aircraft on instrument approaches and issue radar advisories to the pilot when weather is below VFR minimums (1,000 and 3), at night, or when requested by a pilot. This service is provided only when the PAR Final Approach Course coincides with the final approach of the navigational aid and only during the operational hours of the PAR. The radar advisories serve only as a secondary aid since the pilot has selected the NAVAID as the primary aid for the approach. Prior to starting final approach, the pilot is advised of the frequency on which the advisories are transmitted. If, for any reason, radar advisories cannot be furnished, the pilot is so advised. Passing the final approach fix inbound (nonprecision approach) or passing the outer marker or fix used in lieu of the outer marker inbound (precision approach). Trend advisories with respect to elevation and/or azimuth radar position and movement are provided. If, after repeated advisories, the aircraft proceeds outside the PAR safety limit or if a radical deviation is observed, the pilot is advised to execute a missed approach unless the prescribed visual reference with the surface is established. 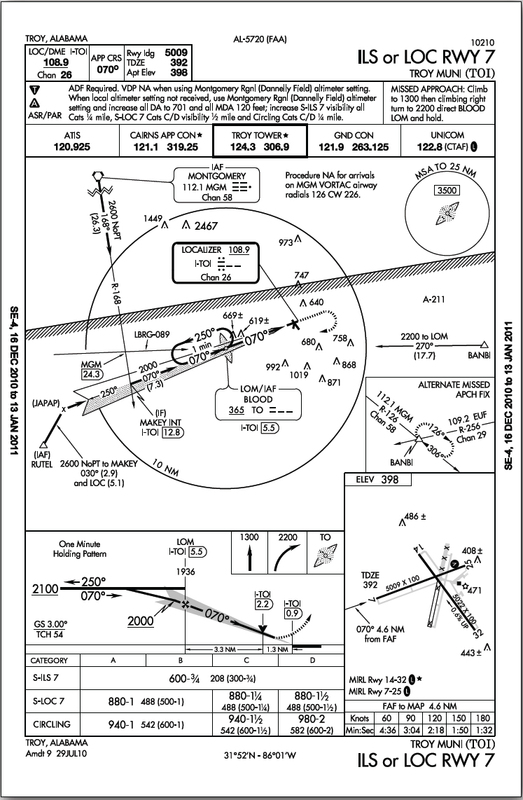 If only one MAP is available, the following conditions are met: a) Course reversal is not required; and b) Reported ceiling and visibility are equal to or greater than the highest prescribed circling minimums for the IAP.